Whats Scope Dope? Scope Dope is a simple but necessary tool for anyone engaged in the art of precision shooting, whether at paper, game or bad guys. Scope Dope gives a shooter quick access to critical ballistic information when they need it. Right now! Scope Dope is a quick reference ballistic data disc designed to fit inside the cover of a “flip-open” riflescope cap like those made by Butler Creek. The Scope Dope kit also comes with a rectangular range card. The data disc and range card are made from heavy die cut vinyl combined with an ultra durable UV cured printing for a professional look and unsurpassed durability. Pre-record rifle/ammunition specific ballistic data (DROP/DRIFT) out to 1000 yards/meters. Range Card fits perfectly on the Mildot Master ballistic data section. Change data discs for specific rifle/bullet/load combinations in seconds. Record adjustment as "clicks" on the scope or "inches" of hold-over/under. Waterproof! Reusable! Change data anytime. Never again guess at crosshair placement. Write your data in any format that you like. Use yards or meters. Clicks or inches. Wind drift at 10 mph or 20 mph. Change your data any time. You custom tailor your data to your needs. Its simple to install with no alterations to the scope or the scope cap, and its easy and fast to change out discs. Change data for your favorite target load to your favorite hunting load in seconds. 1) Using the permanent marking pen provided in the Scope Dope kit, fill in the appropriate ballistic data for the specific load and rifle combination that you will be using the Scope Dope data disc/card with. • Mark the appropriate range block that you "zeroed" your weapon with an "x". Additionally, you may circle the number for the range at which you zeroed. • Fill in the remaining "Drop" range blocks with the ballistic data for your load/configuration. Typically rise would be marked as (-) and drop as a (+). Data is generally recorded as either "clicks" of MOA adjustment or "inches". Personal preference will dictate. Any form of personal shorthand is also acceptable. 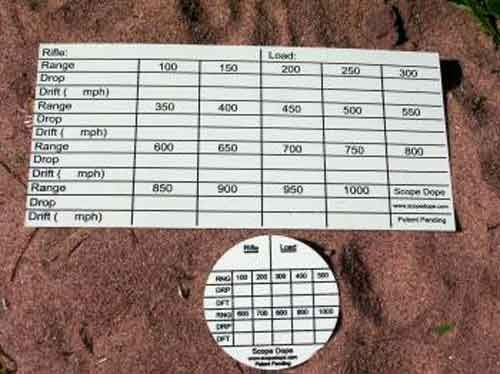 • At the left edge of either data card write the anticipated miles per hour (MPH) of the expected Drift variance as "10" or "10mph", as an example. Any form of personal shorthand is acceptable. Each of the individual range blocks may then be filled with the corresponding Drift data. 2) Using the provided double-sided stick tabs, peel the paper backing off and affix in the center of the rear side of the Scope Dope data disc. Peel off the remaining paper backing on the double sided stick tab, center the disc and press the data disc into the inside cover of the scope cap. This should securely affix the data disc. You may use two tabs if required. Simply pop or pick out the current data disc and then you may replace it with another data disc for a different load to be used. 3) The provided adhesive Velcro is to be used to attach the rectangular Scope Dope range card to any surface that the shooter determines, such as a Mildot Master. Peel off adhesive backing from female side of the Velcro and attach it to the male side of the Velcro. Attach the exposed adhesive side of the female to the rear center of the Scope Dope range card. Remove the remaining protective backing from the male side of the Velcro, while centering the card on the desired surface, firmly press the rectangle Scope Dope data card. The card should be easily removed by separating the Velcro sides. 4) To clean or change information on a data disc or data card, simply wipe each disc or card vigorously with the included alcohol pads and wipe dry with a clean soft cloth. Isopropyl rubbing alcohol and a clean soft cloth will also work well. Be careful not to use any abrasive material to wipe the data cards.